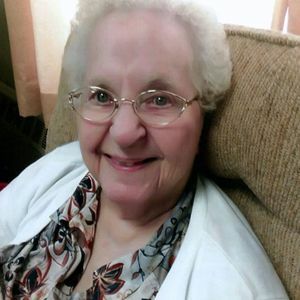 Eleanor M. Jacobs, age 93, of Zeeland, passed away Monday, April 1, 2019. Eleanor was preceded in death by her husband, Harold, in 1999; one son-in-law; four brothers; and one sister. Eleanor is survived by her children, Harold "Chip" Jacobs of Holland, Betsy (Casey) Harthorn of New Mexico, Martha Kraai of Kansas, Patricia Krontz of Holland; 11 grandchildren, 31 great grandchildren; 6 great-great grandchildren; and a brother, Don (Barb) Pell of Grand Rapids. Visitation is scheduled for 4:00-5:00pm Thursday, April 4 at the Holland Salvation Army, 104 Clover St., followed immediately by a memorial service at 5:00pm. Burial will be in Manlius Township Cemetery. Memorial contributions may be made to offset funeral expenses. Arrangements are by Langeland-Sterenberg Funeral Home, www.langelandsterenberg.com. Add your thoughts, prayers or a condolence to Eleanor's guestbook.